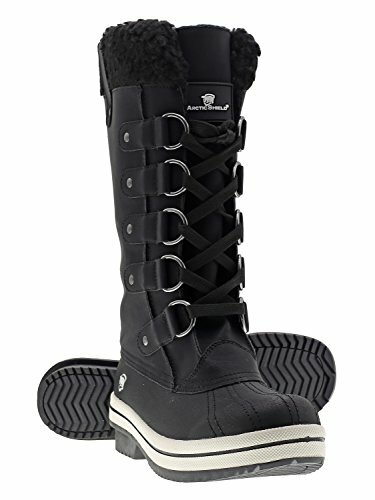 These super-durable, waterproof, insulated and stylish construction of Arctic Shield's Women's winter boots combines with lightweight insulation to provide reliable warmth and protection as you challenge the winter wilderness . Heat-resistant Arctic Shield insulation captures and returns up to 90% of your body's warmth, preventing radiated body heat from escaping and cool external conditions from gaining access. Plus, this lightweight, windproof water-resistant insulation keeps you comfortable whether you're trekking to work in cool weather or outdoors shoveling your way out of the next blizzard - and it does so far better than other, more costly insulation's that merely slow the loss of body heat. All-Terrain outsoles provide ground-gripping traction to keep you sure-footed over a variety of unforgiving surfaces. These perfect Boots will be an unique present for your friend, Wife or mother who loves the outdoors and a great gift for her in the coming Christmas. It will also be the best present to strengthen your family relationships. RUGGED ALL TERRAIN OUTSOLES: Super lite base protects against the cold and wet elements. Durable rubber with slip-resistant patches for excellent traction on various searches. REMOVABLE INSOLES: Cushioned insoles for supportive comfort and warmth. EMBRACE THE OUTDOORS: These perfect boots will let you embrace the outdoors with the utmost confidence while staying in fashion.